The initial aspects of divine geometry are based on three symbols, the triangle, cube, and circle, and are known as the three keys to heaven. 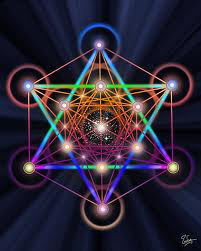 Sacred Geometry will give you an experience of the energies of heaven that are found in our world. ▲ Awaken and invoke the powers of the three primary sacred geometries (pyramid, cube, and sphere) within your body. ▲ Connect your mind to the Divine Spirit by accessing the keys to Heaven with these sacred symbols. ▲ Mesh sacred geometry with the four elements to enable all of your physical creations to be instilled with the Divine. ▲ Activate a room or a building, increasing the vibration for protection of all those within. energies in their daily lives. Learn to activate a room, a house, create a Temple and more. Sacred Geometry 1 is 4-hours and costs $85. Sacred Geometry 2 teaches how to grid rooms or homes for protection, wholeness, connection with God and more. Also ancient healing methods with crystals are taught. Ritual Masters can be hired to grid your home or office for any of the above and more at $150/hr. Sacred Geometry 3 we tap into the powers of the Family or Ra and the ancient Egyptians to clear and activate all 7 dimensions of the aura. Learn to do this for yourself or for others. In Sacred Geometry 4 learn about the vibration of Melchizedek's Temple and Noah's Temple. Learn how to use toning and Divine Geometries to activate energetic patterns that create sacred space in your home, office or special event. Sacred Geometry 2, 3 & 4 are 6-hours each and each cost $150. Join us on this exciting experiential journey through the upper realms of life. Cost of Class - $150/ea. - Each class is a full day. Check the online calendar for dates or call to arrange your own FREE consultation and counseling session.